Reference number for this case: 10-sep-54-Onnaing. Thank you for including this reference number in any correspondence with me regarding this case. Around the famous alleged close encounter of the third kind of Marius Dewilde on September 10, 1954, in Quarouble, there were, according to the press, other testimonies which seemed to corroborate the story. One of them was a sighting in Onnaing, on the same night, at the same hour of 10:30 p.m., where a young man, Edmond Auverlot, and a retired man, Mr. Hublard (or Hubard or Hubblard), saw a red or reddish glow move in the sky. This observation is mentioned without details by Marc Thirouin, who investigated the Dewilde case, in 1960. He noted that he had been told that the movie theaters of Vicq and Onnaing had suffered a drop in lighting around the time of the Quarouble landing, but that he was unable to receive any authorized testimony on this matter. In 2016, "skeptical" ufologist Dominique Caudron, operating in the Nord, indicated that he found Press sources mentioning many observations that night in the area, indicating that it was a meteor, citing a newspaper talking about its trail in an observation by a dozen people. A machine which would land on crutches and not on wheels like our planes would not leave different traces, stated one of the police of the air inspectors. The story made by Mr. Dewilde is also confirmed by the testimonies of several people in the area. In Onnaing, a young man, Mr. Edmond Auverlot, and a pensioner, Mr Hublard, saw, at 10:30, p.m., the time indicated by M. Dewilde, saw a red light moving in the sky. The same light was seen from Vicq by three young people coming out of a ball. All these testimonies, these facts, give to the account of Mr. Dewilde a color of authenticity. However, many people remain skeptical. Mr. Dewilde is undoubtedly of good faith; but one year ago he was victim of a serious industrial accident (cranial traumatism), in the continuation of which he showed some nervous disorders. So one thinks he might have been the victim of " waked up hallucinations", well-known phenomenon in medicine. French ufologist Aimé Michel notes that on September 10, 1954, in Onnaing, which is located two kilometers south from Quarouble, Mr. Edmond Auverlot et Mr. Hubblard have observed at about 10:30 p.m., a red glow which was moving in the sky, coming seemingly from the direction of Quarouble. The sighting was discovered by unspecified investigators, who wanted to find out whether other people saw something similar to the famous observation by Marius Dewilde à Quarouble. In his account of the observation of Marius Dewilde, Marc Thirouin mentioned that there was another sighting in Onnaing, 2 km SW of this locality, where a red glow was also seen in the same direction by two witnesses. In a footnote, he indicated that one told him that the Vicq and Onnaing movie theaters suffered a drop in lighting around the time of the landing of Quarouble, but that he could not receive on this matter an authorized testimony. "The narrative made by M. Dewilde is also confirmed by several inhabitants of the region. In Onnaing, a young man called M. Edmond Auverlot and a retired man, M. Hublard, have seen about 10:30 P.M. (the time indicated by M. Dewilde) a reddish light traveling in the sky. The same light has been seen from Vicq by three young men." 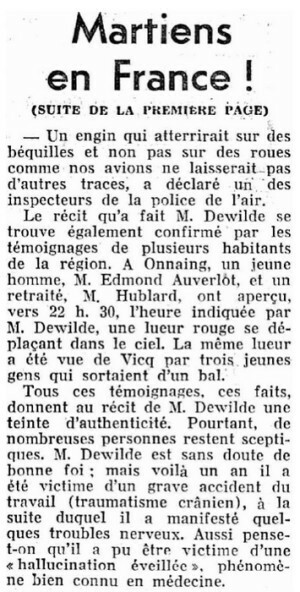 The author indicates that Mr. Dewilde's visual testimony of a UFO in flight was confirmed by two other visual testimonies of glowing red devices, moving in the sky around 10:30 p.m., one of them in Onnaing, two kilometers southwest of Quarouble, by two people. The two French authors and ufologists, while exposing the famous encounter by Marius Dewilde, thus report that two other observations lend credibility to that story. It happened that Mr. Edmond Auverlotte and a pensioner, Mr. Hubbard, from Onnaing, which saw the same day towards 10:20 P.M. a red gleam changing to light pink then white; it moved in the sky. Rene Pacaut indicates that at the same hour as the observation of Marius Dewilde, two men of Onnaing , Mr. Auverlotte and Mr. Hublard, visually followed a gleam which changed color while moving in the sky. The two authors indicate that on September 10, 1954, at 10:30 P.M., in Onnaing, two witnesses observed a red gleam cross the sky above Quarouble. More important then that however, were two reports that lent support to the Dewilde case. At the village of Onnain [sic], just to the south of Quarouble, two people saw a red blob in the sky coming from the direction of Quarouble at approximately 10:30 p.m., the time of the supposed "encounter with two creatures" behind Dewilde's home. The witnesses at Onnain were M. Edmond Auverlot and a M. Hublard. Moreover, some Frenchmen returning from a dance at the village of Vicq sighted a reddish luminosity in the air when they were 1/2 mile from Quarouble. The time was: 10:30 p.m. The course of the UFO as reported by these men agreed with that given by the witnesses at Onnaing. 63. The author indicates that the story by Mr. Dewilde is confirmed by several inhabitants of the region. In Onnaing, at about 10.30 p.m. (the time indicated by M. Dewilde), a young man called M. Edmond Auverlot and a retired man, M. Hublard, saw a reddish light travelling in the sky. This ufologist indicates that on September 10, 1954, in Onnaing, the Nord, at 2 km in the South of Quarouble, "Messrs Auverlot and Hublard saw towards 10:30 p.m., a red gleam in the sky coming from the direction of Quarouble." Luc Chastan indicates that in Onnaing in the Nord (59) on September 10, 1954, at 10:30 p.m. "Two witnesses observe a red gleam cross the sky above Quarouble." The source is noted as "Ovni, Premier dossier complet... by Figuet M./ Ruchon J.L. ** Alain Lefeuvre pub. 1979". [fa1] Article in the foreign newspaper Feuille d'Avis, Neuchatel, Switzerland, page 1,9, September 16, 1954. [am1] "Mystérieux Objets Célestes", livre par Aimé Michel, Arthaud publisher, France, 1958. [am1] "Flying Saucers and the Straight-Line Mystery", livre par Aimé Michel, version anglaise de "Mystérieux Objets Célestes", S.G. Phillips publisher, USA, 1958. 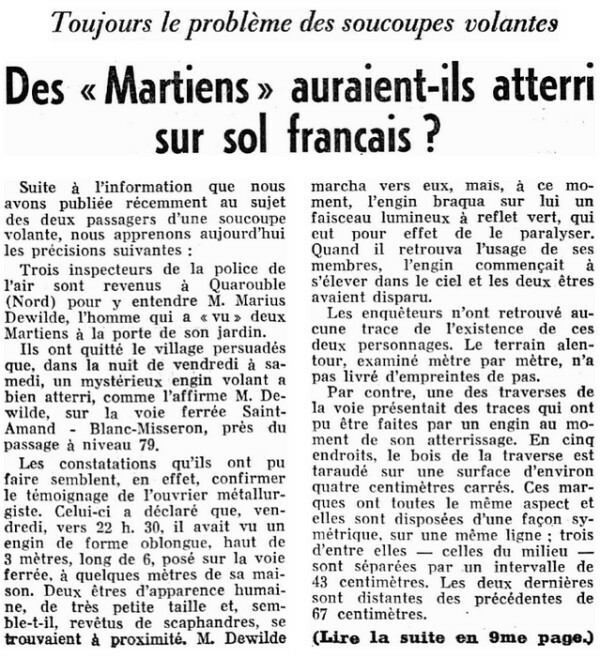 [mt1] "Marius Dewilde n'a pas menti - Des Ouraniens lui ont parlé...", investigation report by Marc Thirouin, in the ufology magazine Ouranos, Marc Thirouin editor, France, #25, pages 24,25, 1st quarter 1960. [am1] "A Propos des Soucoupes Volantes", livre par Aimé Michel, réimpression de "Mystérieux Objets Célestes", Planète publishers, France, 1969. [gl1] "Face Aux Extraterrestres", book by Charles Garreau et Raymond Lavier, Jean-Pierre Delarge publisher, France, page 133, 1975. [gl1] "Face Aux Extraterrestres", book by Charles Garreau et Raymond Lavier, J'Ai Lu publisher, France, page 137, 1975. [am1] "Mystérieuses Soucoupes Volantes", book by Aimé Michel, Seghers publisher, France, page 66, 1976. 0.1 Patrick Gross October 17, 2007 First published. 1.0 Patrick Gross March 18, 2010 Conversion from HTML to XHTML Strict. First formal version. 1.1 Patrick Gross July 4, 2010 Additions [ab1], [lc1]. 1.3 Patrick Gross October 17, 2016. Addition [fa1]. 1.5 Patrick Gross January 28, 2017. Additions [hd1], [lg1], [dc1]. 1.6 Patrick Gross April 17, 2019. Addition [mt1]. In the Summary, addition of the paragraph "This observation is mentioned without details by Marc Thirouin..." Explanations changed, were "Not looked for yet".